Who will be assisting me during the whitening process? A trained Authorized Dealer or their employee will assist you. They are not dentists or dental personnel. This is not a dental procedure; it is a cosmetic procedure. They will not be performing any invasive actions. They don’t insert their fingers, instruments, or anything in a customer’s mouth. They guide you through a self-administered procedure that you perform on yourself. Does the FDA regulate whitening gel? Are there side effects associated with whitening? The two most common side effects are soft tissue irritation and hypersensitivity to the teeth. Irritation typically occurs when either an ill-fitted tray or the whitening agent is in direct contact with the soft (gum) tissue for a prolonged period of time. That is the reason that we recommend a series of 15-20 minute treatments. Sensitivity usually occurs when there is a high concentration of hydrogen peroxide used and/or when the pH of the whitening agent is more acidic. These side effects are considered mild and temporary and if present can be alleviated with an over-the-counter pain reliever or a Sensodyne™-type toothpaste. With discontinued use these issues are usually resolved within a few hours. Most of our customers experience no pain or sensitivity after the treatment. A very small percentage of people may feel a minor ache in the first ten to twelve hours following the procedure. Taking an over the counter pain medication can help resolve this discomfort. Avoid cold or hot drinks for the first 24 hours if there is any tooth sensitivity. The use of a Sensodyne™-type toothpaste can often immediately eliminate any minor sensitivity issues. Our whitening treatment cannot change the color of porcelain crowns or veneers. What is the difference between other methods of whitening? Our whitening technique whitens your teeth immediately and has no side effects. The result is 30% better than home whitening products and comparable technologies and at 1/3 the price (or less!) than having your dentist whiten your teeth. Each session cycle takes 15-20 minutes and up to 2 or more cycles may be required for full effect. It is that simple! Yes, scientific studies have shown that using Peroxide to whiten teeth is both very effective and very safe. The dental industry has used it in teeth whitening for over twenty years. It does not change or damage the structure of teeth; it merely makes teeth whiter and brighter. In fact, peroxide compounds have been safely used in various cosmetic procedures for many years. There is a significant amount of clinical data particularly in strong support of a neutral pH, peroxide-based system. This varies from person to person and depends on your diet, but the effects should usually last for a year or more. We offer additional treatments starting at $40*, which most people do every 6 months, or for those who want to get, keep, and maintain the brightest, whitest smile possible, we recommend our Membership Package.. Ask your dealer about those two options. *Multi Treatment Package purchase. How white could my teeth get? Is this whitening treatment for everyone? This treatment delivers exceptional results to people whose teeth have been stained by smoking or by substances like coffee, tea, or cola drinks. However pregnant women, children under the age of 15, and customers with periodontal disease are discouraged from undergoing this procedure. 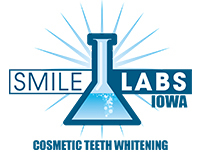 Smile Labs Iowa is NOT a dental practice or office. We do not give medical advice. If you are unsure if you are a candidate for teeth whitening, please consult your dentist prior to booking an appointment. Love your smile, every single day. Shelana – and Smile Labs – are phenomenal! I was really impressed with how easy, quick, and inexpensive the process of whitening my teeth was, and what a big difference!! I love it and am planning on sending all my friends that way. She makes everything extremely comfortable, and as I said before, the process is painless and effective. Two thumbs up! My wife and I purchased whitening sessions from Shelana and have absolutely no regrets! We both saw immediate improvement! Shelana’s set up is relaxing and professional. From the minute we walked in, she made us feel very comfortable and we did not feel rushed at all. I hate the dentist so I had visions of going to the dentist’s office, but this was not the case! Shelana walked us through each step and explained what to do after the session to ensure the whitening lasted as long as possible. Definitely recommend Shelana and Smile Labs to every professional that is in front of clients or needs to make a good first impression! Just 15-30 minutes will help strenthen your first impression for not a lot of money! Thanks to Shelana at Smile Labs Iowa in WDM, both my daughter and I have a confident smile! When you get braces, they never tell you that you will end up with bracket markings on your teeth. It happened to both of us. It took me more than 10 years to find a solution. Luckily, with our new connection to Shelania, my teenage daughter didn’t have to wait at all! If you or anyone you know are getting braces taken off, make sure to have an appointment scheduled to have your teeth whitened with Shelana at Smile Labs Iowa in WDM! I saw a difference immediately in my teeth! They are so nice and friendly there! One for for this place AMAZING!!! Great place, great customer service, great results! This is a MUST!!! You will not be disappointment book today! Great Experience!!! My smile is so BRIGHT! The experience was amazing…would totally recommend this treatment!! The improvement was immediate! Very friendly & knowledgeable staff that made me feel very comfortable. I am very pleased with the results & will definitely be a return customer! Thanks just doesn’t seem like enough :). Highly recommend this service especially since it costs 2-3x as much for the same thing at a dentists office. Smile Labs Iowa is NOT a dental practice or office. We do not give medical advice. If you are unsure if you are a candidate for teeth whitening, please consult your dentist prior to booking an appointment.